ADV-8948 - 16/32/48-Channel QAM Modulator | AdvancedDigital Inc. The ADV-8948 is a broadcast QAM modulator designed for full compliance with QAM (DVB-C) modulation standards. 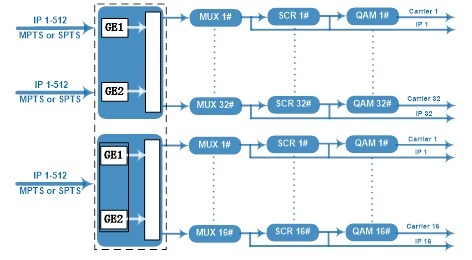 It has 512/1024/1536 IP inputs through GE ports, 16/32/48 multiplexing channels, 16/32/48 scrambling channels and 16/32/48 QAM (DVB-C) modulating channels with non-adjucent carriers (50MHz~960MHz) output through the RF output interface.